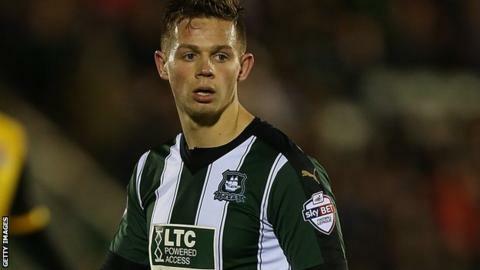 Plymouth Argyle remain top of League Two after a narrow win over Stevenage. The hosts took an early lead when Carl McHugh headed home from a Jake Jervis corner after three minutes before Charlie Lee levelled with a shot at the far post after six minutes. Jervis crossed for Gregg Wylde to head home and McHugh set up Craig Tanner to score from 18 yards and make it 3-1 at the break. Lee slid in to score his second but the Pilgrims held on for the win. "The desire was there, but once Plymouth went 3-1 up we just gave ourselves an uphill battle. "We need to wise up in the future, and make sure we are more clinical in all areas from the first to the last whistle. "The way the team have been playing, I may be looking at adding eight or nine players at this rate." Match ends, Plymouth Argyle 3, Stevenage 2. Second Half ends, Plymouth Argyle 3, Stevenage 2. Charlie Lee (Stevenage) wins a free kick in the defensive half. Foul by Peter Hartley (Plymouth Argyle). Foul by Tom Pett (Stevenage). Jake Jervis (Plymouth Argyle) wins a free kick in the defensive half. Attempt missed. Gregg Wylde (Plymouth Argyle) left footed shot from the centre of the box is too high. Attempt blocked. Gregg Wylde (Plymouth Argyle) left footed shot from the left side of the box is blocked. Attempt saved. Ryan Brunt (Plymouth Argyle) right footed shot from the centre of the box is saved in the centre of the goal. Attempt saved. Oscar Threlkeld (Plymouth Argyle) right footed shot from the centre of the box is saved in the centre of the goal. Substitution, Plymouth Argyle. Ryan Brunt replaces Reuben Reid. Corner, Stevenage. Conceded by Carl McHugh. Substitution, Stevenage. Jack Jebb replaces Aaron O'Connor. Foul by Dean Parrett (Stevenage). Carl McHugh (Plymouth Argyle) wins a free kick in the attacking half. Corner, Plymouth Argyle. Conceded by Connor Ogilvie. Substitution, Plymouth Argyle. Oscar Threlkeld replaces Craig Tanner. Craig Tanner (Plymouth Argyle) is shown the yellow card for a bad foul. Foul by Craig Tanner (Plymouth Argyle). Attempt missed. Jake Jervis (Plymouth Argyle) right footed shot from outside the box is just a bit too high. Foul by Charlie Lee (Stevenage). Foul by Carl McHugh (Plymouth Argyle). Attempt missed. Reuben Reid (Plymouth Argyle) header from the right side of the six yard box is just a bit too high. Corner, Plymouth Argyle. Conceded by Fraser Franks. Connor Ogilvie (Stevenage) wins a free kick in the attacking half. Foul by Jake Jervis (Plymouth Argyle). Foul by Aaron O'Connor (Stevenage). Peter Hartley (Plymouth Argyle) wins a free kick on the right wing. Attempt saved. Reuben Reid (Plymouth Argyle) right footed shot from a difficult angle on the right is saved in the bottom left corner. Corner, Plymouth Argyle. Conceded by Ronnie Henry. Foul by Connor Ogilvie (Stevenage). Attempt missed. Dipo Akinyemi (Stevenage) right footed shot from outside the box misses to the right. Attempt saved. Carl McHugh (Plymouth Argyle) left footed shot from outside the box is saved in the centre of the goal. Dean Parrett (Stevenage) is shown the yellow card for a bad foul. Peter Hartley (Plymouth Argyle) wins a free kick in the attacking half.